It’s no secret that us Aussies have a bit of a thing for New Zealanh. From the sweeping coastlines, rugged mountain ranges, ferny forests and open plains, New Zealand has everything you could ever want and so much more. With so much beauty on offer, it would be a shame for you to miss any of it, so we’ve rounded up nine of New Zealand’s most beautiful spots that you might not even know existed. You might have been to Putaruru Blue Springs as they tend to get all the glory, but the Hamurana Springs are just as breathtakingly beautiful. With impossibly clear freshwater streams, the Hamurana Springs wind their way through a redwood grove and play host to many species of birds living in the wildlife sanctuary. Close to Rotorua and just three hours from Auckland, a visit to the Hamurana Springs feels like stepping into another world. Hailed by many as the most beautiful falls in the country, the Marokopa Falls cascade 35 metres down the cliff face. Accessible via a short track through a forest of tawa and nikau, the Marokopa Falls will leave you speechless with their grandeur. Located just a few kilometres from Waitomo, the falls are the perfect pre or post-glow worm stop. 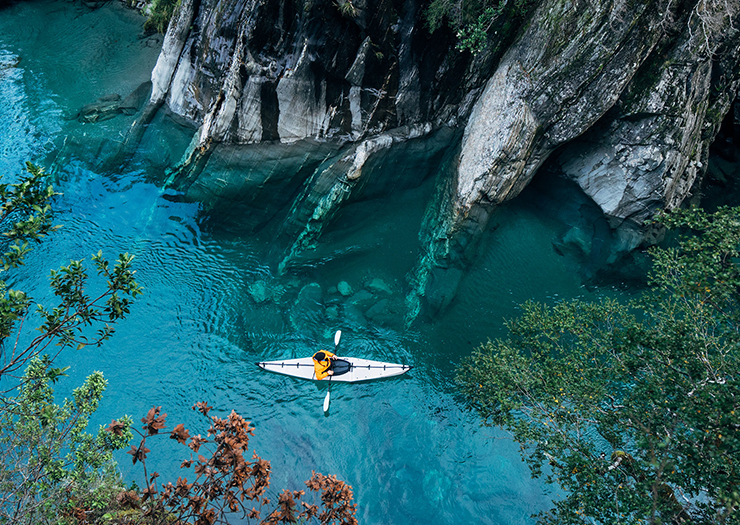 Tucked away in what you might mistake for a magical land, the Blue Pools of Haast Pass are found after a short walk through a stunning forest in the Southern Alps. The pure glacial pools are insanely deep and clear and will basically blow your mind. Face your fears and walk the swing bridge for the perfect insta shot. Nothing says New Zealand like a rugged mountain range and Te Urewera has to be one of our most beautiful. Follow the Lake Waikaremoana Track to get up close and personal with New Zealand’s largest remaining native forest or visit Aniwaniwa and pick up a kayak to explore on the lake itself. Lake Waikaremoana was formed 2200 years ago by a huge rockslide that separated it from the Waikaretaheke River and the result is one of New Zealand’s most incredible landscapes. Us Aussies love a good beach, so Cape Kidnappers should be high on your list of places to visit but this stunning spot has escaped the notice of many. The craggy peninsula is found in the Hawke’s Bay area and is named after an incident during Captain Cook’s voyage of 1769. Watch the late afternoon sun reflect off the pale rock face or check out the world’s largest mainland gannet colony, found at the top of Cape Kidnapper’s sheer cliffs. Follow up with dinner at one of the Hawke’s Bay’s many wineries and you’ve got yourself the perfect weekend escape. New Zealand is home to some pretty unique and spectacular places and the Putangirua Pinnacles is definitely one of them. You might never have heard of this place, but you’ll almost certainly have seen it as it appears in the third instalment of the Lord of the Rings trilogy. Natural processes of erosion and concretion have formed an insanely epic landscape over time, leaving hundreds of smaller peaks jutting out from the cliffs. Make like Legolas, Aragorn and Gimli and walk through the Putangirua Pinnacles to take in breathtaking views of Palliser Bay and Lake Onoke. We’ve got another Tolkien inspired location on the list! This one is from The Hobbit: An Unexpected Journey and it looks like old mate Pete knew what he was up to when he scouted places to bring Middle Earth to life. Located near Glenorchy along Lover’s Leap Road (cute! ), a visit to Earnslaw Burn will deliver incredible views from the tussock basin at the head of the valley. Earnslaw Burn is a glacier that has formed a number of waterfalls that cascade down the massive rock faces. The size and the sound of these falls are seriously unreal—one look at it and you’ll be feeling smaller than Bilbo and the dwarves. At the top of the South Island you’ll find New Zealand’s longest sand spit, Farewell Spit. Known as Tuhuroa to the Māori, Farewell Spit stretches for 26 kilometres above sea level and a further six underwater. A mixture of many different metals and minerals provide the spit with its fine, golden sand that has built up into dunes perfect for sliding down on your boogie board. We know you’ve still got one stashed somewhere, so bust it out and give Farewell Spit a visit. No list of New Zealand’s most stunning nooks and crannies would be complete without a mention of the Milford Sounds and this one is no different. Fiordland’s ethereal beauty means many hidden gems, such as Lake Marian, an alpine lake nestled in a rocky valley. The track up to the lake is equally breathtaking—not only is it pretty steep, it’ll also take you past a series of magnificent waterfalls.